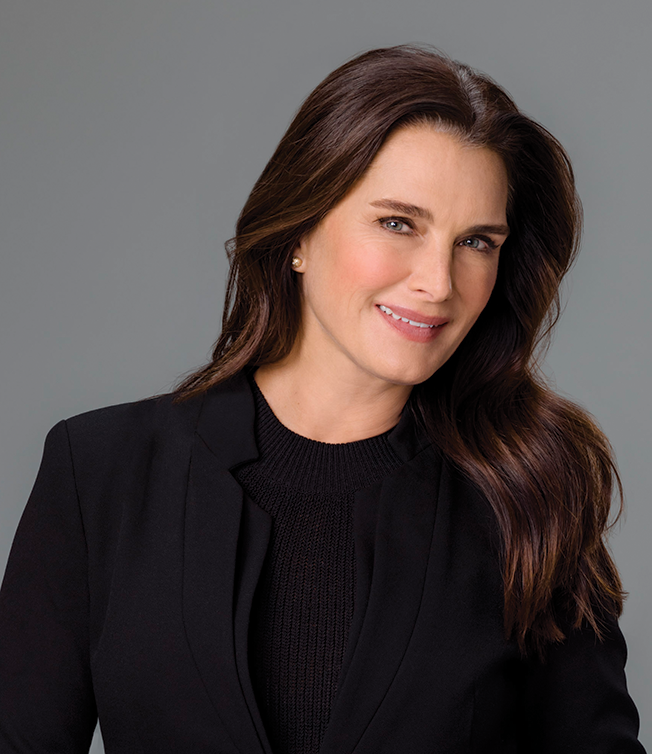 Brooke Shields: I go downstairs and I open up the door and I get The New York Times. I don't go to any of my devices until I've had my tea. I still like reading my paper, even though I'm slowly coming into this century. I'm an Instagram fan. I think it's one of the first things that I didn't feel overwhelmed by. I have two daughters, and they're obsessed with Instagram and Snapchat and all of those things, and it's always been so terrifying to me as a parent [laughs]. It's taken me a little while to sort of come around to it and feel comfortable with it because I get to dictate it myself. People have had access to my life in one way or another from the time I was getting my braces on—which was filmed!—so any further invasion into my personal life took me off guard. Do you keep track of your daughters' social media? Oh, yes. Yes I do [laughs]. We've had many a conversation about it, and the phone has been taken away many a time. They're still under the belief that just because they can't see a Snapchat after 24 hours or whatever, it doesn't exist. I'm going to prove it to them somehow. It's just a question of whether I use fear tactics or not [laughs]. Finally my daughter did tell me, "Mom, I promise you, I will tire of this soon," so I am encouraged that her kissy face from every angle really does have a shelf life. Do you use Snapchat yourself? I don't. There's something about it that I just don't understand. I don't need to take a bite of pasta and have it be seen by someone in Arizona. It's mostly my friends or editors of magazines that I know or I think are super chic, just because I'm always pumping them for information and this is a way for me to see what they think is cool. Architectural Digest is the one I go to first. I like European Vogue, and I've got a friend who's an editor at Bazaar, so I keep up with her. I'm not a big tabloid person. I hardly recognize anyone on the covers anymore. But I really love decorating magazines. For me, reading them is like going on a mini-vacation. Whether it's Architectural Digest or Metropolitan Home or HGTV, you can get a completely different perspective in each one, and I find that refreshing. I'm loving Outlander, and I'm a big Downton Abbey person. But I don't really follow a lot of TV, just because I don't have the time. It's all I can do to give myself 30 minutes to read, let alone sit down and watch a show. You're a frequent a guest host on the Today show. How do you typically prepare for that? There's always a list of hot topics, and [the producers] send you every link to all the different places where you can read about whatever the subject is. I'm a big homework person, so I like that. The hosts have got it down so that they only have to look at bullet points. Willie [Geist] always makes fun of me because, of course, I've got all these highlighted notes and different colored pens. I take it very seriously!